by H. DeWayne Ashmead, Ph.D.
Louis Renault built his first automobile in 1898 at the age of 21 and demonstrated it to a group of friends when he attended a Christmas Eve party (Figure 1). The automobile so impressed these friends that he left the party with orders for 12 replicas. In order to efficiently produce those orders, Louis formed a partnership with Renault Frères, a company previously founded by his older brothers, Marcel and Fernand, and their automotive company was born. Marcel was the managing director; Fernand controlled the finances; and Louis was in charge of manufacturing. One hundred seventy nine cars were sold in 1899. By 1903, Renault Frères was producing over 3,000 automobiles annually and employed about 600 people.That same year, 1903, Marcel was killed while participating in a Paris to Madrid automobile race. Louis purchased his late brother’s shares in the company from Marcel’s mistress. Five years later, when Fernand was forced to retire from the business due to illness, Louis bought Fernand’s shares as well and became the sole owner of Renault. 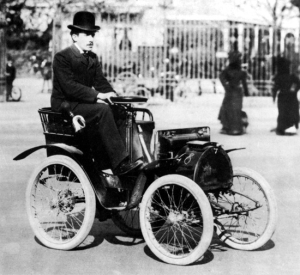 Under his autocratic hand, Renault Frères quickly became the largest automobile manufacturer in France. Business flourished and the Renault empire increased. Louis was no politician and loyal only to Renault. Everything he did, he did in order to build up his company. Consequently, during World War II when the Germans occupied France, Louis was faced with a no win choice: 1) Cooperate with the Germans in order to prevent his factory and equipment from being deported to Germany. This would potentially cause him to be accused of collaboration with the enemy; or 2) Refuse to cooperate with the Germans and lose everything when his factory and equipment were sent to Germany. In order to save Renault he chose the former and co-managed the company with his German overseers. When Germany was defeated by the Allies, Louis Renault lost everything anyway. The French viewed him as aiding the enemy during the German occupation. This led to his arrest and incarceration. In spite of the French accusation, Louis was not a willing collaborator. He wanted to manufacture cars. When Germany ordered Renault to cease automobile production and only make trucks for the German war effort, he allowed sabotage and strikes to delay the German production orders. Work was accomplished only after those lengthy delays and then with high raw material losses. Louis played for time believing that eventually France, Germany, and Great Britain would agree on a peace treaty which would allow him to return to the business of making automobiles. During the German occupation, Louis ultimately became so demoralized over not being allowed to run his business as he wished that he ceased his long-time habit of patrolling his factories. Instead he locked himself in his office, reportedly doing nothing. In actuality he was defying the German prohibition on the development of a new automobile. With the assistance of Fernand Picard he secretly designed and built a prototype of the 4 CV, a cheap-to-produce and economical-to-run small car in anticipation of the post-war years. Louis believed that there would be a significant demand for an economical automobile during the recovery years when people had little money to purchase and operate larger cars. Louis Renault was right about the 4 CV, but did not live to see his small car produced. The R.A.F. bombed his factories leaving over 80% of them in ruins. With the Allied liberation of France, Louis was imprisoned in September of 1944 on charges of collaboration with the enemy and died there under mysterious circumstances on October 24, 1944. The French government took over his factories and appointed a lawyer, Pierre Lefaucheux, as the administrator. On January 16, 1945, the company was nationalized under the name Regi Nationale des Usines Renault (RNUR) incorporating all of the worldwide business assets of Renault. The French government represented that the company was free to act as a non-governmental entity even though it was now owned by the government. Lefaucheux was a Renault enthusiast who had a vision for the company he was appointed to run. While the factories were being reconstructed, he tested Louis’ 4 CV prototype at his Herqueville estate. In the midst of severe criticism and government opposition, Lefaucheux decided to build the car. It was shown to the press in September 1946 and officially launched a year later. The “Flea”, as it was called, attained sales targets of 300 cars a day by 1949 and increased to 500 cars a day by 1954. By the late 1940’s, Lefaucheux was already thinking about a successor automobile to the 4 CV. In 1950, Lefaucheux announced the commencement of Project 109 and asked Renault’s director of styling, Robert Barthoud, to do a few preliminary sketches. Lefaucheux did not like the original in-house design of Project 109 and approached Carrozzeria Ghia, S.p.A. to redesign the car. Ghia had been formed by Giacinto Ghia in 1915 and had become a well known and respected Italian coachbuilder. During the period between the two World Wars, it had specialized in producing bodies for Italian racing cars that were renowned for their speed and elegance. Based on innovative approaches developed in the 1930’s, Ghia had easily adapted to the changing circumstances in the automobile industry which followed after the Second World War. Consequently, Ghia was able to apply those skills to Lefaucheux’s Project 109, even though the car was to be a mass produced automobile. The result was the Renault Dauphine with the first prototype being built in 1952. Unfortunately Lefaucheux, like his predecessor Louis Renault, did not live to see his pet project marketed. In February 1955, Pierre Lefaucheux was killed in an automobile accident when the car he was driving hit black ice and left the road. His briefcase, which was lying loose in the rear seat, hit his neck and the blow killed him. The French government appointed Pierre Dryfus to succeed Lefaucheux. Dreyfus completed Project 109 and launched the Dauphine in late 1955. Mechanically and in terms of suspension, it was a grown-up 4 CV. The 4 cylinder, 845 cc Ventoux engine produced 30 horsepower (SAE) at 4500 RPM. It transferred power to the transaxle through a 4 speed gear box. Cooling came from a radiator located at the firewall in front of the motor just behind the rear seat. The required cool air was drawn in via side vents located in front of the rear wheels. The car had an independent front suspension with coil springs. The transaxle was mounted to telescopic springs in the rear. The car, with its Italian designed body, was an immediate success, leaping quickly to the top of its market segment even though the “Flea” continued to be produced until July 6, 1961. In 1956, a year after his appointment as the managing director of Renault, Pierre Dryfus embarked on a fact finding mission to the United States. Fernand Picard, the former assistant to Louis Renault and now Renault’s director of research, accompanied him. Dryfus wanted to increase Renault’s market share in the States, but he realized that it would probably require specially designed cars that would appeal to American tastes. As Renault’s director of research, it was logical for Picard to accompany him on the trip as the two men tried to ascertain first-hand what the “American” car should be. As the two men visited various Renault dealerships in the United States and talked to other knowledgeable people, a concept began to evolve. Volkswagen, Renault’s chief competitor, had done a reasonable job of introducing the 1200 (commonly known as the “Beetle”) to the American market, but the Americans wanted a sporty version of the car. Servicemen returning from Europe after World War II had brought MG-TC’s with them. This created an American demand for sporty cars which forced General Motors to build the Corvette and which in turn forced Ford to build the Thunderbird to meet the GM competition. In the meantime, other companies such as Kaiser and Nash introduced their own versions of the sports cars which they thought the public wanted. Volkswagen responded in kind with its mass produced sporty car: the Karmann Ghia. With the exception of the Karmann Ghia, none of these sports cars was a high volume seller for any of the manufacturers. Nevertheless, their images increased the sales of their plebian cousins which justified their existences. The Karmann Ghia, besides being sold in significant quantities, had a very positive effect on the sale of Volkswagen Beetles. Those combined Volkswagen sales in turn were having a negative effect on the sale of Renault Dauphines in America. The Karmann Ghia, which had been introduced in 1955, was an economical to produce 2+2 car because it was built on the running gear of the stock Volkswagen 1200. It had a 34 horsepower 1192cc engine that delivered a top speed of only 77 mph. The car was styled by Ghia in Italy and built by Karmann in Germany. Even though it was really a Volkswagen with different sheet metal, the public loved the car and bought 364,401 coupes and 80,899 cabriolets over the model lifetime from 1955 to 1974. Even more impressive, however, was the number of Volkswagens that were sold because of the Karmann Ghia association. Over 7 million were sold before 1964 when the Beetle was upgraded. During their fact finding tour to America, the Renault dealers in the United States convinced Dryfus that a small convertible would have significant market potential, particularly among women. During the same trip, the two Renault executives attended a dinner party at the residence of the governor of Florida. At the party, talk turned to the Karmann Ghia. Picard suggested to Dryfus that Renault emulate the Volkswagen philosophy and build an automobile that would compete with the Karmann Ghia but be designed especially for the American market. To keep production costs down, he suggested that the Dauphine be used to provide the running gear for the new car just as the Volkswagen 1200 (Beetle) had provided the platform and running gear for the Karmann Ghia. Officially designated as Project 1092, the car ultimately came to be known as the Floride in honor of the place where the idea for this car was conceived. The preliminary sketches were executed at Renault some time after the return of Dryfus and Picard to France (Figure 2). Following their submission, it was decided to once again to involve Ghia in the design process rather than use the original in-house Renault design. Dryfus met with Luigi Segre, then managing director at Ghia, to discuss the new car. Figure 2. 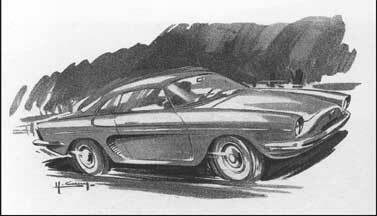 Preliminary sketch of the Dauphine GT (Project 1092). Courtesy Album Dauphine by Dominique Pagneux, E/P/A Editions, 1994. After its successful experience with the Ghia-designed Dauphine, Renault had come to more fully understand the importance of the growing “designer culture” which was emerging in postwar Italy. Cars were being taken beyond the everyday design into the world of art. While the coachbuilders had been doing this in the twenties and thirties on “one-off” automobiles, they now began to apply those design concepts to batch-produced or mass-produced cars and adapted accordingly. As noted earlier, Ghia, one of the oldest Italian coachbuilders, was one of the more successful houses to accomplish this as evidenced by the Renault Dauphine, the Karmann Ghia and the Maserati. Much of Ghia’s reputation was attributed to Luigi Segre along with the Karmann Ghia which he is credited with designing. More than any other car, this special body helped to introduce Italian style and particularly Ghia to the world at large and made a significant impact, particularly on the United States. Pierre Dryfus wanted to capitalize on the Ghia design reputation and experience by offering a practical Italian designed rolling sculpture that would be even more stunning than the Karmann Ghia. Besides Ghia’s reputation and Renault’s past experience with the Ghia-designed Dauphine, there was another reason to select Ghia to create the new car: Its American connection. After spending a decade working with the French automotive designer, Raymond Loewy, Virgil Exner joined Chrysler in 1949 as its chief of advanced styling. Chrysler had a stodgy old man’s car image and Exner was hired to create a new image. Because of the European influence of Loewy on Exner, Exner looked past the warmed-over Detroit styles and wanted to form a relationship with an Italian coachbuilder. He first approached Carrozzeria Pininfarina who was closely allied with Ferrari but subsequently signed an agreement with Carrozzeria Ghia, S.p.A in 1950 to build prototype cars partially based on Exner’s designs with Ghia adding the finishing touches. As noted earlier, Carrozzeria Ghia was founded in 1915 by Giacinto Ghia but at the conclusion of the Second World War, the coachbuilder was co-managed by Mario Boano and Luigi Segre. While both were designers, Segre also had significant business acumen as well as engineering talent. Consequently, when Exner expressed interest in meeting with Ghia on behalf of Chrysler, Segre rather than Boano was chosen to go to America in 1949 to meet with him and Chrysler president, K.T. Keller. Segre, Exner, and Keller formed a close friendship that ultimately led to the departure of Boano from Ghia in 1953 and left Segre in charge. When Dryfus met with Segre on the new project, he explained that Renault wanted a sporty car that would appeal to the American market. Segre accepted the assignment, but in May of 1951, he turned to his friend Virgil Exner for help during a trip to the United States. Because of his employment with Chrysler, obviously Exner could not assist Segre. Instead he recommended that Luigi Segre use Exner’s son, Virgil Exner, Jr. The younger Exner was also an automotive designer having followed in his father’s footsteps. He was serving in the United States Air Force at the time, but was free to enter into a contract with Ghia to produce some designs for the new Renault. A deal was struck with Exner Jr. and he was retained as a consultant for Ghia. Luigi Segre provided the younger Exner with the design parameters for the car including the fact that it was to be built on a platform which was similar to the Dauphine platform with the Dauphine suspension and running gear. Like the Dauphine, it would need side vents to draw air in to cool the engine. He also shared with Exner the sketches that had been previously produced by Renault designers and which suggested the direction Renault was looking. Based on the parameters given him, Virgil Exner, Jr. drew some initial sketches and sent them to Segre. Segre in turn shared them with Renault and received the green light to proceed. In the last half of 1957, while still in the Air Force, Exner produce the formal design for the new car. This design, while Italian, still had American appeal. The Dauphine GT was radically different than the popular Karmann Ghia, but the design was very pleasing and had good market potential. It was truly a European car but would appeal to the American taste. After receiving a green light on the project, Exner sent his final drawings to Luigi Segre who in turn delivered them to Giovanni Savonuzzi. Savonuzzi was Ghia’s chief in-house designer. He made a clay model from Exner’s design which was subsequently shown to Dryfus and others at Renault. 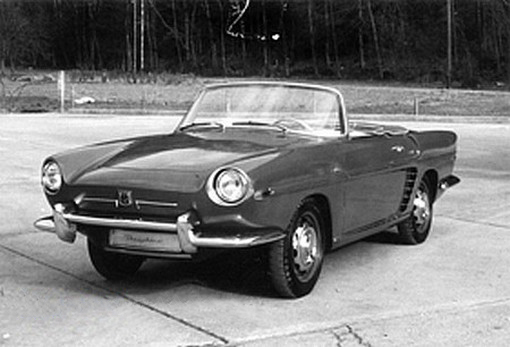 The Renault management approved the model of Project 1092 and authorized Ghia to build a prototype. Sources differ as to who actually built the prototype. Most publications state that Pietro Frua designed and built the prototype for Ghia. Virgil Exner, Jr. states that he designed the car and Ghia built the prototype as well as the first 1,000 cars before turning the business over to Frua. Frua, who began his career at Fiat as a junior designer, became Fiat’s general manager within ten years. After the Second World War, he opened his own design studio where he executed a series of one-off designs. In 1952, Frua entered into a contract to work exclusively for Ghia. That relationship lasted until about 1962 when it ended acrimoniously over a lawsuit related to the Caravelle design. Ghia was in a difficult position in the late 1950’s. It had contractual commitments to Volkswagen and indirectly to Karmann for the highly successful Karmann Ghia. In 1959, Volvo launched the P1800. Volvo had contracted with Ghia to design its car, but because of the Karmann Ghia commitment, Ghia had subcontracted with Frua to do the work. Since Renault appeared at Ghia’s door about the same time as Volvo, and since Renault was a direct competitor to Volkswagen, it seems reasonable to assume that Ghia would involve Frua in the Renault project early on to prevent a conflict of interest. In his book, Renault, Mackenzie Wintle wrote that the R-1092 was designed by Ghia and after a very complicated development, the prototype was built by Frua according to Ghia’s design. According to some sources, Frua built two prototypes in the spring of 1958 using the Ghia design. When the work was completed, he contacted Renault for further instructions. Renault remained silent, presumably because it was Ghia who had subcontracted with Frua, not Renault. Renault’s contract was with Ghia. In the meantime, Ghia was also silent. Ghia’s silence may have been due to the fact that it had not yet paid Frua for the work on the prototypes. Pietro Frua was understandably upset. He had devoted a considerable amount of time building the two prototypes and now no one would talk to him or pay him for his work. He decided to try and sell the design to another automobile manufacturer by showing the design at the Geneva Automobile Show, a major European car show in which the manufacturers presented their new concept car as well as their latest offerings. Frua called the car the Dauphine GT (Figure 3). Figure 3. The Renault Dauphine GT on the street in front of the Salon de Genève in 1958. Automobile journalist Jean Bernardt is preparing to drive the car. Notice the license plate that proclaims it is a Dauphine and that it has wire wheels with spinner hub caps. Courtesy Album Dauphine by Dominique Pagneux, E/P/A/ Editions, 1994. Prior to the opening of the show to the general public, Pierre Dryfus walked by the Frua display and saw the ptototype Renault convertible under a tarp. When challenged by Dryfus, Frua responded that since he had not heard from either Renault or Ghia, he was going to present the convertible as a Frua design. Luigi Segre, who was also present at the show, was immediately put under tremendous pressure by Dryfus to fix the problem. Apparently he did so. In October, following the Geneva show the prototypes were shown for the first time at the Paris automotive event, but on the Renault stand. At that point they carried the Floride name and were offered for sale by Renault. Over 8,000 orders were taken for the sports car from the European side before production began in 1959. Another photo of the prototype Renault Dauphine GT. The Floride was unveiled to the American public early in 1959 at the New York Motor Show. It was an instant success and more than 13,000 orders were submitted for the car. Armed with this type of demand, Renault decided to build 200 cars a day instead of the 30 that the company had initially planned on manufacturing. Three assembly lines had to be geared up at the Brissonneau et Lutz factory in Criel, north of Paris. Floride’s stamped sheet metal for the unibody construction with an optional removable hardtop was produced by Chausson at the factory of French coachbuilder, Brissonneau et Lutz. Chausson also supplied the front suspension. The car had drum brakes. Renault provided the mechanical parts, including the engines and swing transaxles from the Dauphine. A new suspension, known as the Aerostable suspension, was installed on the Foloride shortly after its introduction. Developed by Jean Albert Grégorie, it had rubber cushions on the front and rear axles to act as additional springs. Shifting was accomplished by a three-speed (or optionally a four-speed) transmission with the Ferlec electro-magnetic clutch. An automatic transmission was also available. The car was assembled by Brissonneau et Lutz for Renault. Scale drawing of the 1962 Renault Floride. The Renault Floride was produced for three years from June of 1959 to 1962. While the Dauphine continued to be sold in the export market until 1967, domestically (France), the 1090 platform on which the Floride was based was discontinued by 1963. After having sold 49,716 units, by 1963 the Dauphine-based Renault Floride was no more. In the meantime, Pierre Dryfus realized the dangers of a mono-model culture – something that Volkswagen did not realize. The “Beetle” almost destroyed Volkswagen when its popularity abruptly declined and there was no viable replacement. 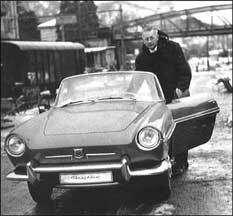 Dryfus was afraid of a looming oversupply of Dauphines, so he accelerated the introduction of other Renault models to replace the Dauphine. The successor to the Dauphine was the Renault Eight which was introduced to the public in 1963. The Renault Eight was propelled by newly developed 956 cc “Sierra” engine. The five-bearing overhead valve engine with its aluminum heads and high temperature combustion chambers was economical but would propel a car much faster than would the Dauphine Ventoux engine. The Sierra engine produced 46 horsepower (SAE) at 4600 RPM. The radiator was relocated to the rear of the engine compartment rather than at the front behind the firewall thereby eliminating the need for side vents for cool air. It drew fresh air in from vents in the rear deck. It had an all-independent suspension system with four wheel disc brakes. The Aerostable suspension disappeared from these cars as well. The Renault Eight provided the basis for the platform for the new Caravelle. Mackenzie-Wintle has written that the Caravelle was to the Renault Eight what the Floride had been to the Dauphine. Each “sports car” used their respective salon’s suspension, engines, and transmissions. With the demise of the Dauphine on the horizon, Renault went directly to Frua and requested a new design for the Caravelle coupe and Cabriolet which would both use the soon to be introduced Renault Eight running gear and suspension. At that time the Caravelle was known as Project R-1133. The design changes made by Frua were subtle. Vincent Grob, President of Renault’s American operations, was later quoted in the Renault News as saying, “We’re not interested in a ‘facelift’ just to give the impression of a new model. People who know cars will recognize the changes underneath.” The unibody construction was reinforced so it would not fold in the middle when the car was jacked up with the doors open. This was a significant problem with the Floride. The new design retained the body contours of the Floride including the countersunk headlights. Across the nose of the car the Floride crest was replaced with the word Caravelle in individual letters. The side vents were smoothed away since the engine now drew its cooling air in through vents in the rear deck cover. Management wanted a true 2+2 design that would accommodate occasional passengers on a rear “jump seat” in the cabriolet and two passengers in the coupe. Consequently, the roof line was squared up and the rear window made steeper to give better headroom to the occasional rear passenger. When the Caravelle was unveiled, Pietro Frua took total credit for its design. While there were certainly differences in the design of the Caravelle compared to the Floride, those differences were not apparent to the casual observer (Figure 4). Ghia objected to Frua receiving the credit for the Caravelle design and filed a lawsuit to establish its rights to the design. The suit was ultimately settled, although Ghia and Frua remained acrimonious. Officially Ghia took credit for the Caravelle’s design, but most publications cite Frua as its designer. Figure 4. Line drawings showing some of the differences between the Floride and the Caravelle. With the introduction of the R-1133 to the market, the name of the car was officially changed from Floride to Caravelle in Europe. The name change had occurred somewhat earlier in the United States. After-the-fact, marketing research revealed that the name “Floride” created a purchasing problem for many prospective U.S. buyers. Since many potential customers resided in states other than Florida, they were not particularly enthusiastic about buying a car that was called Florida. Consequently, Renault used the names Caravelle and Floride together for a while. By late 1962 when R-1133 was introduced, the Floride name was dropped and the car was simply called the Caravelle. The R-1133, or Caravelle, replaced the transitional R-1092 which was known as the Floride S. Built only in 1962, but sold in certain markets for over two years, the Floride S utilized the 956cc Sierra engine and cooling system from the Renault Eight but was still essentially a Floride with the side air intake vents smoothed over. The “S” in the name Floride S denoted the Sierra engine, which produced 2 horsepower more than the same engine in the Renault Eight due to a higher compression head (9.5:1 vs 8.5:1). Officially, the Floride S was available as a convertible only, although a few cars were sold with the optional Ghia-designed hardtop. The Floride S was built because Renault did not have a sufficient quantity of the 845cc Ventoux engines needed to install in the Floride bodies that were still in inventory. The Renault Eight with its 956 cc Sierra engine was already being produced. Renault simply took enough Sierrra engines off the line to complete the Floride body run before switching to the Caravelle body. The new Caravelle (R-1133) continued to employ the same Sierra engine, so the transition from the R-1092 to R-1133 was relatively simple. In 1963 displacement in the Sierra engine was increased from 956cc to 1108cc. This pushed the maximum horsepower from 48 (SAE) at 5000 RPM to 56 (SAE) at 4600 RPM. For whatever reason, the Caravelle utilized a Ducellier generator with a higher output instead of the Bosch generator found in the Renault Eight engine. At this same time all of the gears in the transmission became synchronized and the fuel tank was expanded from 8 to 10 gallons. Brakes were Locheed disk design on all four wheels which necessitated slotted wheels for cooling. That same year the Caravelle Cabriolet was launched which meant that the heretofore optional removable hardtop now came as standard equipment. The cabriolet had a small “emergency” rear seat with the convertible top mechanism taking up the rest of the space whereas the coupe had a full rear seat for two. The seats were also redesigned to increase comfort to both the front and rear passengers. Another change to the engine occurred in 1966. Renault replaced the Solex carburetor it had been using since increasing the displacement to 1108 cc in 1963. The engine now employed a dual throat Weber carburetor. The Weber carburetor continued to be used until the end of the Caravelle production. The new carburetor increased the horsepower of the Caravelle engine to 58 SAE horsepower at 5400 RPM. In 1967, Renault made its final changes to the Caravelle. All of the instrument clusters found in Florides and Caravelles produced prior to 1967 included a speedometer, an odometer, and a fuel gauge. In 1967 Renault added a tachometer to the instrument cluster and changed the steering wheel design. By 1967 the Renault Caravelle was becoming dated. Its styling had evolved from the Floride introduced in 1959 through the Floride S in 1962 to the Caravelle, which was introduced that same year. Through the eyes of the uninitiated, it had maintained the same body style for eight years. Furthermore, while built primarily for the American market, it did not compete well with the muscle cars of the era which were becoming popular. While its performance could probably have been enhanced with a 104 horsepower Gordini engine available in some Renault Eight cars, the Caravelle still would not have fared well against 300 and 400 horsepower American cars. Even if the Caravelle car had been fitted with a Gordini engine and raced in the then popular Sports Car Club of America (SCCA) sanctioned races against other cars in its class, it would have probably been a handful. To quote Rees in his book, Classic Car Buyer’s Guide, “All Caravelles are distinctly dodgy handlers”. In Europe, the Caravelle was not as widely distributed as in the United States because, as noted above, the majority of the production was shipped to the United States. Consequently it was never seriously driven in rally races, whereas the Renault Eight was. In the end, it was time for Renault to cut the Caravelle loose. This occurred in 1968 for Europe and 1967 in America. The last Caravelle rolled off the assembly line in July of 1968. Since then, the Caravelle has come to be regarded as a minor classic by many automotive authorities. were 1133 cars. The last 3000 cars produced had seat belts, tachometers and Weber carburetors as standard equipment. Production ceased in 1968. 1. Dennis Adler, “The 1956-1958 Dual-Ghias”, Car Collector 26:45, February 2003. 2. R. Bellu, Toutes Les Renault (Delville:Paris) 1979. 3. David Burgess Wise, The New Illustrated Encyclopedia of Automobiles (Quarto Publishing Ltd: London, England) 1979. 4. Eric Dymock, The Renault File (Dove Publishing: London, England) 1999. 5. Virgil Exner, Jr., Interview with H. DeWayne Ashmead, 2002. 6. John D. Kelly, ed., Chilton’s Repair and Tune-up Guide for the Renault (Chilton Book Co.:Philadelphia, Penn.) 1972. 7. Mike Lawrence, A to Z of Sports Cars 1945 – 1990 (Bay View Books Ltd: Devon, England) 1991. 8. J.L. Loubet, Renault – Cent Ans d’Historie (Paris:ETAI) 1998. 9. Hector Mackenzie-Wintle, Renault (Sutton Publishing, Ltd.: Glouchester, England) 1998. 10. Muller, Michael, “The Floride/Caravelle Story”, Renault News, p. 14-16, Issue 67, 2003. 11. Dominique Pagneux, Album Dauphine (Editions E/P/A: Paris, France) 1994. 12. Chris Rees, ed., 1996- 97 Classic Car Buyer’s Guide, (Bay View Books, Ltd: Devon, England) 1996. 13. Renault News Bureaus, “Disc Brakes and More Power for Renault’s Caravelle ‘S'”, Renault News, 1963. 14. Penny Sparke, A Century of Car Design, (Octopus Publishing Group: London, England) 2002.